Eating Liberally’s kat (a.k.a. Kerry Trueman) asks one of her inimitable “Ask Marion” questions, this one about Michael Moss’s blockbuster story in today’s New York Times about dairy lobbying. KT: Sunday’s New York Times has a disturbing exposé by Michael Moss about the USDA’s efforts to aid the dairy industry by encouraging excessive cheese consumption. Can the USDA ever reconcile its two mandates? On the one hand, the USDA has the task of tackling the obesity epidemic by encouraging healthier eating habits. Yet it must also promote the interests of U.S. agriculture. As Moss documents so well, these two missions are in total conflict. USDA, convinced nutritionists that dairy foods were equivalent to essential nutrients and the only reliable source of dietary calcium, when they are really just another food group and one high in saturated fat, at that. The department acknowledged that cheese is high in saturated fat, but said that lower milk consumption had made cheese an important source of calcium. ‘When eaten in moderation and with attention to portion size, cheese can fit into a low-fat, healthy diet,’ the department said. So let’s talk about “moderation,” a word that I find hard to use without irony. The pizza illustrated in Michael Moss’s article is described as a “thin-crust medium pie.” The diameter is not given, but one-fourth of the pie contains 430 calories, 12 grams of saturated fat (20 is the daily recommended upper limit), and 990 mg sodium (the upper limit is 2,300). Who eats one-quarter of a pizza? Not anyone I know. So double all this if you share it with a friend. If you eat the whole thing–and why do I think that plenty of Domino Pizza customers do?–you are consuming more than 1700 calories, nearly 4,000 mg sodium (that’s 10 grams of salt, by the way), and 48 grams of saturated fat. This is enough to make any nutritionist run screaming from the room. So why is USDA in bed with dairy lobbying groups? That’s its job. From its beginnings in the 1860s, USDA’s role was to promote U.S. agricultural production and sales, with the full support of what was then a largely agricultural Congress. Only in the 1970s, did USDA pick up all those pesky food assistance programs and capture the “lead federal agency” role in providing dietary advice to the public. This is what Mrs. Obama is up against in her efforts to reduce childhood obesity and bring healthier foods into America’s inner cities. A pipe dream? Maybe, but I never thought I’d live to see the editors of the New York Times consider an article about USDA checkoff programs to be front-page news, and in the right-hand column yet, marking it as the most important news story of the day. Eating Liberally asks Marion: Is stealth the way to healthy eating for kids? That is why I am so intrigued by the approach shown in the New York Times “Lunch Line Redesign” op-ed last week. Check out the way that Brian Wansink and his colleagues suggest redesigning lunch lines. These do nothing draconian or deceitful. Instead, they gently nudge kids to made healthier choices on their own. I understand you had a bad experience with sneaky spinach as a child, but I respectfully disagree with your position that sneaking healthy food in kids’ meals is a bad idea. As the author of the Sneaky Chef cookbooks, I receive thousands of testimonials from parents to the contrary. They are thrilled that their kids are finally eating veggies–and most of the kids are in on the secret and love it. The reason sneaking is needed is highlighted in the recent CDC report showing that all of the efforts and billions of dollars spent on nutrition education has failed. Everyone now knows that they SHOULD eat their veggies. The problem is HOW to get them to do it. Teaching alone is conclusively insufficient–we need to sneak and teach. They work hand in hand. Sneaking veggies gives people an easy way to experience the benefits of eating veggies, yet lets them enjoy their favorite foods, like spaghetti and meatballs–-only now they’re loaded with spinach, broccoli, peas, wheat germ and cauliflower. This direct experience opens the door to learning. The bottom line is: combining “sneaking and teaching” works for everyone. Not exactly everyone, if I may respectfully submit. But I’m glad she wrote. OK, readers: opinions, please! Eating Liberally: What’s up with Walmart? Every now and then I answer questions from Eating Liberally’s Kerry Trueman (kat). Today’s is about Walmart’s sustainability initiatives. Let’s Ask Marion Nestle: Is Wal-Mart’s Sustainability Strategy For Real? Submitted by KAT on Fri, 10/15/2010 – 12:20pm. With these new initiatives, Wal-Mart suppliers will have to figure out ways to produce foods sustainably–without increasing the cost to Wal-Mart. So this move costs Wal-Mart nothing. It gains plenty. This move should recruit supporters of sustainable and locally grown food and induce them to overlook the company’s retrogressive labor practices. This is also posted on Huffington Post. And the New York Times has a story on it. KT: The last two episodes of Jamie Oliver’s Food Revolution have yet to air, but folks are already assessing whether Oliver’s attempt to launch a culinary coup in the community of Huntington, West Virginia was a success or a failure. Jamie’s ‘people’ consulted you at the start of this project. Did they heed your advice? If it had been your show, how would you have gone in and done it? • Food service personnel who not only care what the kids eat, but also know the kids’ names. Addition April 21: Jane Black of the Washington Post has done a thorough evaluation of the TV series accompanied by notes on her personal interview with Jamie Oliver. She thinks he did some good. Me too. Kat: New York City’s new initiative to persuade food manufacturers and restaurants to voluntarily reduce the salt in their foods by 25% over the next five years is eliciting the usual outrage from the “nanny state” naysayers, for whom excess salt consumption is yet another matter of personal responsibility. But as you noted last Monday, “nearly 80% of salt in American diets is already in packaged and restaurant foods and if you eat them at all you have no choice about the amount of salt you are getting.” Many Americans consume more than double the daily recommended intake of sodium, contributing to thousands of deaths and billions in medical costs annually. Technically, this is true, if you’re willing and able to eliminate packaged foods from your diet, stop eating out, and start cooking all your meals from scratch. Unfortunately, the percentage of folks who have the time, inclination, and resources to do this is roughly on a par with those who think that Wall Street’s robber barons earned those big bonuses. The food industry maintains that it would gladly reduce the sodium in its products–and some are doing so surreptitiously–if only consumers conditioned to crave super salty foods would be more willing to accept reduced sodium products. The “invisible hand” of the market can’t seem to let go of the salt shaker. Mayor Bloomberg’s proposal is a step in the right direction, but do you think it will achieve meaningful reductions, or will we ultimately end up having to regulate salt? Dr. Nestle: I love nanny-state accusations. Whenever I hear them, I know either that food industry self-interest is involved or that the accuser really doesn’t understand that our food system already is government-regulated as can be. These kinds of actions are just tweaking of existing policy, in this case to promote better health. At issue is the default. Right now, companies have free rein to add as much salt to their processed or prepared foods as they like. The makers of processed foods do focus-group testing to see how consumers like the taste of their products. They invariably find that below a certain level of salt–the “bliss” point—their study subjects say they don’t like it. Soups are a good example. A measly half-cup portion of the most popular Campbell’s soups contains 480 mg of sodium or more than a full gram of salt (4 grams to a teaspoon). To someone like me who has been trying to reduce my salt intake for years, those soups taste like salt water. That’s because the taste of salt depends on how much you are eating. If you eat a lot, you need more to taste salty. If you are like me, practically all processed and restaurant foods taste unpleasantly salty. So what to do? I say this is indeed a matter of personal choice and right now I don’t have one. If I want to eat out at all, I know I’m going to feel oversalted by the time I get home. I want the default choice to be lower in salt. Nobody is stopping anyone from salting food. You don’t think your food tastes salty enough? Get out the salt shaker. But let me make two other comments. One is that the amount of salt we eat is so far in excess of what we need that asking food makers and sellers to cut down can hardly make a dent in taste. A new Swedish study just out says that young men consume at least twice the salt they need and the authors are calling on government to require food makers to start cutting down. And yes, the science is controversial and not everyone has blood pressure that goes through the roof when they eat something salty. But lots of people do. And almost everyone has blood pressure that goes up with age. As a population, we would be better off exposed to less salt in our diets. Some food makers are already gradually cutting down on salt, but quietly so nobody notices. If every food company were required to do that, everyone would get used to a less salty taste and we all might be able to better appreciate the subtle tastes of food. My guess is that Bloomberg has started a movement and we will be seeing much more effort to lower the salt intake of Americans. As I see it, this is about giving people a real choice about what they eat. Correction, January 22: Juli Mandel Sloves of Campbell Soup correctly points out that I am in error. A serving of soup is 8 ounces, not 4, even though the label says that a serving is half a cup. How come? Because the can is to be diluted with another can of water, making it 21 ounces divided by 2.5 servings per can, or about 8 ounces. Complicated, no? But this means the sodium content is 480 mg per cup, not half cup, despite what the label says. I apologize for the error. But here is an excellent reason to redesign the Nutrition Facts label, alas. Eating Liberally: Are pets responsible for climate change? Let’s Ask Marion: Is Fido The New Hummer? Submitted by KAT on Tue, 12/22/2009 – 8:13am. 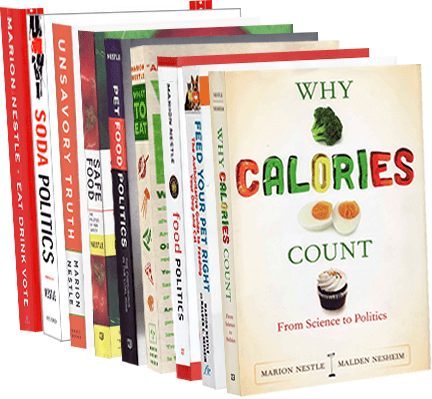 (With a click of her mouse, EatingLiberally’s kat corners Dr. Marion Nestle, NYU professor of nutrition and author of Pet Food Politics, What to Eat and Food Politics. Kat: Dog lovers are howling over a new book called Time to Eat the Dog: The Real Guide to Sustainable Living. The book claims that “the carbon pawprint of a pet dog is more than double that of a gas-guzzling sports utility vehicle,” according to a report from the Agence France Presse. The book’s authors, Robert and Brenda Vale, sustainable living experts at Victoria University in Wellington, New Zealand, estimate that a medium-sized dog’s annual diet–about 360 pounds of meat and 200 pounds of grains–requires roughly double the resources it would take to drive an SUV 6,200 miles a year. You’ve become an expert on the pet food industry in recent years with Pet Food Politics: The Chihuahua in the Coal Mine, and your upcoming book, Feed Your Pet Right. So, what’s your take on the Vales’ claims? Is Fido really the new Hummer? We don’t really have all the facts at hand. We have not seen the book, we don’t know what assumptions the authors made, and we can’t be certain that the review quotes the book accurately. Still, we are puzzled by these figures. By our estimates, an average dog does indeed need about 300 grams of dry dog food a day; this much provides close to 1,000 calories. Fresh meat supplies about 2 calories per gram, so 450 grams would yield about 900 calories. Cereals have less water so they are more caloric; they provide nearly 4 calories per gram. The 260 grams of cereals would provide nearly 1,000 calories. If New Scientist got it right, the authors of the book are overestimating the amount of food needed by dogs by a factor of two. On the qualitative side: Most dogs don’t eat the same meat humans do. They eat meat by-products—the parts of food animals that we wouldn’t dream of eating. These are organs, intestines, scraps, cuttings, and other disgusting-to-humans animal parts. We think pet food performs a huge public service. If pets didn’t eat all that stuff, we would have to find a means of getting rid of it: landfills, burning, fertilizer, or converting it to fuel, all of which have serious environmental consequences. If dogs and cats ate the same food we do, we estimate that just on the basis of calories, the 172 million dogs and cats in American would consume as much food as 42 million people. But they don’t. They eat the by-products of human food production. If we want to do something to help reverse climate change, we should be worrying much more about the amount of meat that we ourselves are eating–and the amount of cereals we are growing to feed food animals–than blaming house pets for a problem that we created.